Lightroom CC: Keep all your photography in one place. You can organize, edit, and share your photos from anywhere—on your computer, on the web, and on your mobile device. Photoshop: Enhance, retouch, and manipulate photographs and other images in any way you can imagine with the world’s most advanced image-editing app. Mobile apps: Take advantage of Lightroom mobile and Photoshop Mix to extend the power of the desktop apps. Training: Get the most out of your tools with training to help you discover new features and master new skills. Latest technology: Access new features and updates as soon as they’re available. Enhance and perfect your photos. From everyday edits to total transformations, the Creative Cloud Photography plan has the tools you need to show everyone how you see the world. Edit and enhance on your desktop and devices. All your changes stay in sync, so you can enjoy your photos anywhere. 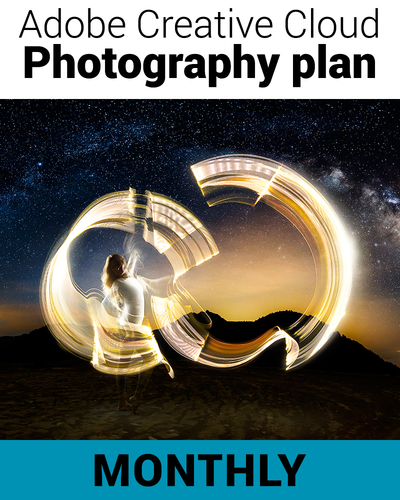 With the Creative Cloud Photography plan, you can organize, edit, and share your photographs from anywhere—on your computer, on the web, on your mobile device. Syncing takes care of itself, so when you make an edit or flag a favorite in one place, it’s automatically updated everywhere else. It’s easy to showcase and share what matters most to you. All your photos—from your DSLR to your camera phone—are automatically synched to Lightroom. From there, you can organize images in beautiful web galleries or craft stories and animated videos with mobile apps like Adobe Voice and new Adobe Slate. Access a vast online library of how-to videos and tutorials to learn basic, intermediate, and advanced photography techniques. Share your work with a burgeoning online community to get feedback, tips, and tricks. 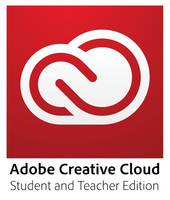 Learn to be a better photographer with the Adobe Creative Cloud Photography plan. Retouch images with incredible control and precision—and virtually no effort. Select an image object that you want to remove, rescale, or reposition, and Content-Aware technology fills, patches, extends, or recomposes your image for you. Photoshop makes it easy to create for any medium. Use type styles, editable shapes, enhanced Scripted Patterns and Fills, vector layers that let you apply strokes and gradients to vector objects, tools for quickly creating custom strokes and dashed lines, and more. Bring your Photoshop editing skills to your video footage. Make any clip look better using the full range of familiar Photoshop tools, and create movies with an easy-to-use set of video tools. When you’re ready to do more advanced work, edit with Adobe Premiere Pro. Apply Camera Raw edits as a filter to any layer or file inside Photoshop, and then enhance them any way you want. And with new Adobe Camera Raw 8, you get more precise ways to heal images, fix perspective distortions, and create vignettes. Quickly give your work the look of a fine painting with the Oil Painting filter powered by the Mercury Graphics Engine. Simplify painting with new presets that offer a good starting point for creating realistic painting effects. Create realistic airbrush effects using fluid, lifelike controls and granular paint particles. Apply Blur Gallery and Liquify effects nondestructively thanks to Smart Object support. Your original file stays intact as you add blur effects or push, pull, pucker, or bloat the image or video. Edit or remove the effects at any time—even after saving your file. Create across devices and the desktop, access your work anywhere from the cloud, and freely share with the creative community. Crop images faster and with greater precision. The most-used tool in Photoshop is even more useful, offering hardware acceleration, nondestructive editing, and a modern design that lets you manipulate your images on canvas and see your adjustments happen live. Make your images spotless with a single brush stroke. Adjust the size of the brush and move it in precise paths. Unwanted objects and flaws—even those with irregular shapes like threads—just disappear. Create natural-looking or surreal images from extremely high-contrast scenes. Using HDR Merge, you can easily combine multiple shots taken with different exposure settings into a single high-dynamic-range image. Capture super-wide fields of view and amazing detail. Photomerge technology lets you stitch together multiple images, including raw files, to create stunning panorama shots.